What we have here for this Retro Review edition of Longbox Junk is a NON-CCA horror comic that came out in 1973 as part of that big horror resurgence. 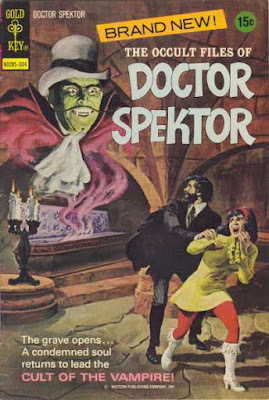 From what I've been able to find out about it, Doctor Spektor is a practically forgotten character, and remains little more than a footnote in horror comic history. So let's take a closer look at this artifact from the 70's, shall we? So right off the starting line, this comic has a VERY nice painted cover. It's a bit deceptive as to the actual story inside, but that was pretty much par for the course when it came to horror comics in general. I couldn't find a credit for the artist, but it LOOKS like the same artist who did the interiors (Jesse Santos). In any case, no matter who did the cover, it's 70's-tastic in every way! Inside, there's two stories. "Cult of The Vampire", the longer main story, and a 4 pager in the back by the same creative team called "Little 'Ol Coffin Maker". I'll take a look at them separately. So when I take a look at the art and script credits, something catches my eye. The name of the writer (Don Glut) seems familiar, but at the same time, not familiar for some reason. I look up his name and it hits me. He wrote one of my favorite books! A novel I must have read at LEAST a dozen times when I was younger. . .the novelization of "The Empire Strikes Back". Extra points in my book right there. The main story quickly introduces us to the main characters. . .Doctor Adam Spektor and his assistant, Lakota Rainflower. . .and the general series setup, which is that he's a scientific investigator of monsters and the paranormal and she's a paranormal skeptic. Like I said, it's all done very quickly. The info-dumping takes up about 2 pages and isn't intrusive or annoying. The writing in general moves at a snappy pace through the whole book, but I really liked how the introductions were handled. Doctor Spektor has been researching a drug that might possibly cure vampires. He hears about a possible vampire in Transylvania, so he decides to go there, hunt down the vampire, and try to cure him. The vampire in question is called Baron Tibor, who was defeated and staked about 40 years before, and has been revived by a cult who will serve him in exchange for immortality. When Spektor and his assistant arrive in Transylvania, they are immediately targeted and attacked by the cult, leaving Spektor for dead and bringing Rainflower to Baron Tibor so that he can feed on her. What the cult doesn't realize is that Baron Tibor doesn't WANT to lead a cult or feed on the innocent any longer. While trapped between the world of the living and dead when he was staked in the grave, he realized he was a monster and deserved to be punished. He's more than a little angry that his punishment has been interrupted, so he fights his blood thirst and flees the cult. . .but leaves Rainflower in their hands. Doctor Spektor and Baron Tibor encounter each other, and after a short battle, Tibor tells Spektor the truth of things. . . he's a changed man and wants to do no harm, and will help Spektor rescue Rainflower. In exchange, Spektor agrees to use his new drug on Tibor and try to cure him of his curse. They rescue Rainflower with a ruse where Tibor pretends he's going to drink her blood, then make their escape and leave the cult in the hands of a mob that has gathered from the nearby village. Spektor's cure isn't a full cure, Tibor is still a vampire, but the drug eliminates his thirst for blood. They part ways as friends, with Tibor promising to make the best of his second chance. Overall, I really liked this story quite a bit. The writing was snappy and moved at a fast pace, and the twist of the vampire not wanting to be a vampire any more was unexpected. I could definitely tell that this was a product of the 70's with some of the dialogue, but that didn't make the story any less enjoyable. As for the art, I found it to be very nicely done, with a dark and moody, detailed look to it that perfectly matched the story being told. I had never heard of this artist, but compared to a lot of the other comics from the 70's I've read, he's really quite good. I Wiki'd him up and found out that he wasn't very prolific, having only worked on a handful of comics before going into animation, but I think he could have stood toe to toe with any of the more well known artists at the time. His work on this particular issue is outstanding! It's done by the same writer and artist, so it shares the same snappy writing and fantastic art as the main story. It involves a hunted criminal who breaks into a coffin maker's shop to hide from the police. He doesn't realize that the coffin he hides in was specially made for Count Dracula himself. The coffin maker locks him inside, and when Dracula comes to pick up his new coffin, there's a little something extra waiting for him when he gets home and opens it up. For being so short, the backup is really enjoyable. I think in most part due to the talents of the writer and artist. It COULD have fallen flat on its face, but it didn't. It wasn't quite as funny as it was trying to be, but still a very nice little piece of filler. I bought this comic at a flea market for $1 and had never heard of Doctor Spektor before. Now I want to try and find more issues (it had a 24 issue run) of this title. The story was unexpectedly good, the art was fantastic, and all in all I have to say that was probably one of the best dollars I've ever spent. I only have one real negative with this book and it's that I feel the lack of a CCA seal was totally wasted here. Being a horror book focusing on vampires, it was remarkably bloodless for not having CCA approval. That small gripe aside, I would definitely suggest this issue to any fan of 70's horror comics that hasn't read it yet. Back to Longbox Junk business as usual with some one shots!